Who doesn’t like a special dinner after a long day? Best quality fresh pork with perfectly matched apple and sweet potato will certainly give our dogs a taste experience. With great ingredients you also get added health benefits too that help them look their best and feel great. 50% Pork with lots of fresh meat gives them a gourmet dinner experience. Grain free and naturally easy to digest. Pork is such an unusual protein source in dog foods that every dog loves the taste. Our recipe uses 50% Pork with Apple and Sweet Potato to provide a top of the range gourmet experience that will set their tail wagging. As expected, when you use luxury high quality ingredients you get some added health benefits. Gourmet Pork & Apple with Sweet Potato is crammed full of vitamins, minerals and healthy oils designed to bring the best out of our doggies. 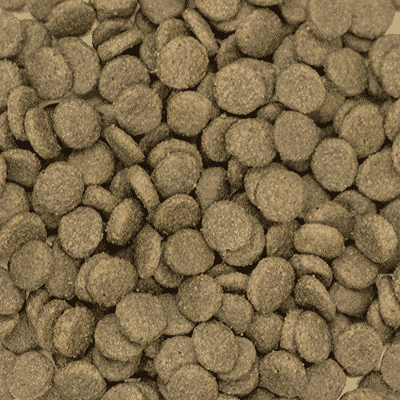 It’s grain free too making it ideally suited to dogs prone to allergies or sensitivities. 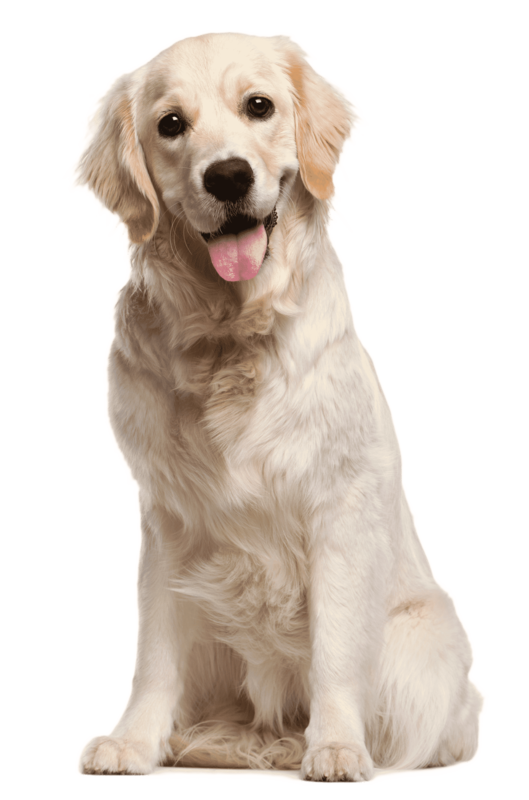 Natural goodness helps trasnform their coat in to grade A condition. 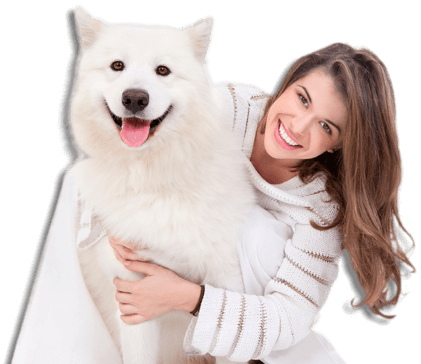 A human quality protein source that dogs will go out of their way for. Dogs love the taste of Pork. It’s a rare dinner option that they go mad for. Chester, our chocolate labrador has recently diagnosed with various allergies and was advised to change his current dry dog food. 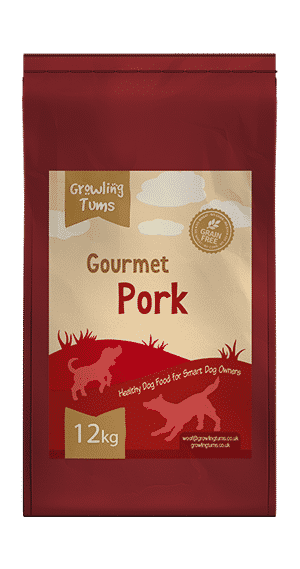 Growling Tums was recommended to us by our vet and after looking at your various types opted for the sweet potato, pork and apple variety for him to try. Chester absolutely loves it! We will definately be buying more when the current bag runs out. Like many other wired haired terrier owners our 3 year old Parsons was diagnosed with every allergy you can think of, and she even went on the the immune therapy course of injections with no effect. I’m convinced it’s 90% from within and only 10% from the outside elements; I also think you can rule out Rice, Lucerne, and Alfalfa from the ingredient lists hence my purchasing from Growling Tums We also religiously feed grain and rice ‘free’ treats from another supplier and never food from our table like toast that has Wheat! Under the magnifying glass we could see tiny brown lesions on her skin that we think were causing itching and skin irritation; these have dissapeared over the last 3-4 months and she has far less rashing on her chest than ever before even in the long grass. I have recommended GT to others as it has the right ingredient list unlike so many other Premium Foods. Both my dogs love this, and I’m saving over 25% over my last brand. I have a Golden retriever and a cocker spaniel. My only wish is that it came in 6kg bags as I could buy 2 different flavours and mix it up. My dog Bella a seven year old cocker spaniel had to go on a diet after her yearly check up at the vets. She was having a mixture of high quality wet food and dry food and when we went to the vets she had put on a kilo of weight, had bad breath, a small amount of tarter on her teeth due to the hidden sugars in the wet food and full glands, so she was in a not so healthy way. I have had to take her off the wet food altogether and I wanted a top quality grain free food that wasn’t going to cost the earth. I have found this in growling tums, Bella took about three days to get used to it and now she loves it, after only a week she has lost weight, her stools are regulated, her glands are no longer full and itchy, her breath is much better and she has lots more energy. I will certainly be trying the other flavours. Truly deserving of the 5 stars, a very happy dog and owner. very impressed with this dog food, our american staffy suffered with terrible wind and runny poos which now seems to have settled down and thats only in the first week, very happy cheers to great results. Smelt delicious when I opened the sack. Coat glossy and dog perky since starting on this sack of pork variety. just ordered the lamb version today so we will see how her allergies go with the lamb.